Special Note: Downsize this recipe! Just cut milk and chia in half. The other ingredients can remain the same. 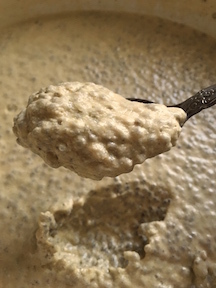 8 C Almond Milk (you may need to add more depending on how thick you want this filling). If you like thicker filling, use less milk. 2. Using a highspeed blender combine roughly half of the ingredients. 3. 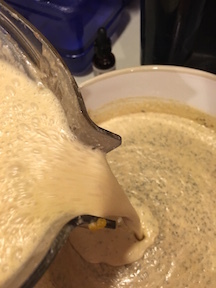 Blend, starting slow - increasing power until running on high and mix becomes frothy. 4. 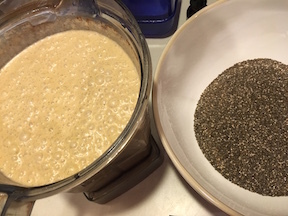 Pour about 2/3 over Chia Seed and, using a wooden spoon or spatula, fold mixture together until all Chia is blended into mixture. It will begin to thicken immediately. 5. IF YOU ARE MAKING A FULL BATCH, Mix the rest of ingredients in the blender. 6. Liquefy on high speed. 7. Pour over Chia Seed mix and hand stir until all ingredients are mixed well. 8. TASTE. If you need more maple syrup, stevia or vanilla, etc., add now. 9. You need to begin with the right consistency or filling will be too thick! 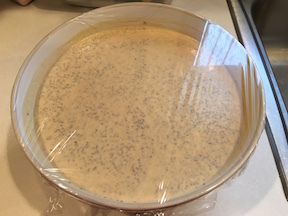 This filling thickens as the liquid is absorbed by the Chia Seed, so make sure you like both the taste (you can add more sweetener or spices but make sure it’s folded in well) and the texture is smooth but not too thick. Like a good melted ice cream. 10. Allow to sit on the counter about 20 minutes. 11. Stir, folding with spatula, just a few turns to make sure all the seeds are coated. 12. Put into the frig for at least two hours – overnight is best – this is our favorite!